PDF, how to approach it for keywords effectively. On our website we distinguish between two kinds of PDF documents, the searchable and none searchable ones. The latter files are being based upon scanned documents, which cannot be approached for keywords. 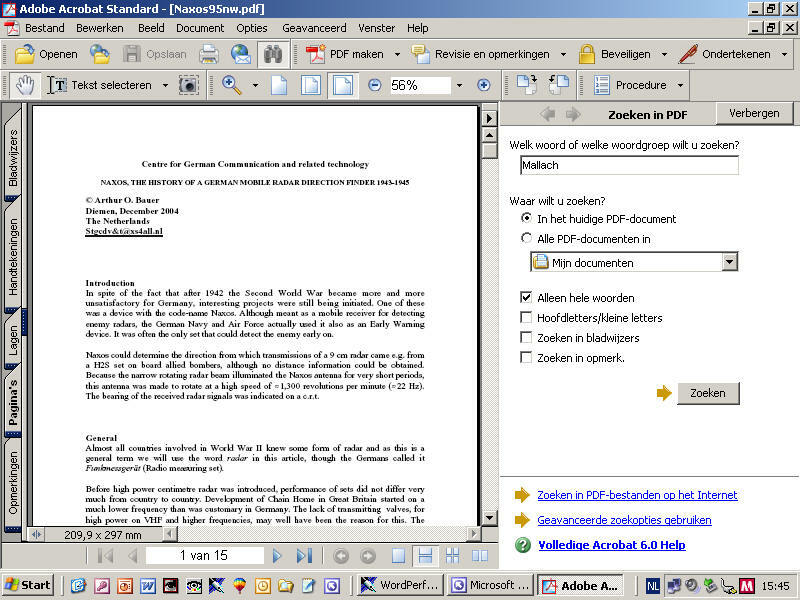 We have converted the first kinds of files from Word, Access, WordPerfect or comparable formats into a PDF document (due to an ingenious procedure omitting one the shortcomings of MS), providing searching inside documents. Select the document you want to look at (for this occasion, I have selected "Naxox95nw pdf"). Your Acrobat reader will open automatically. 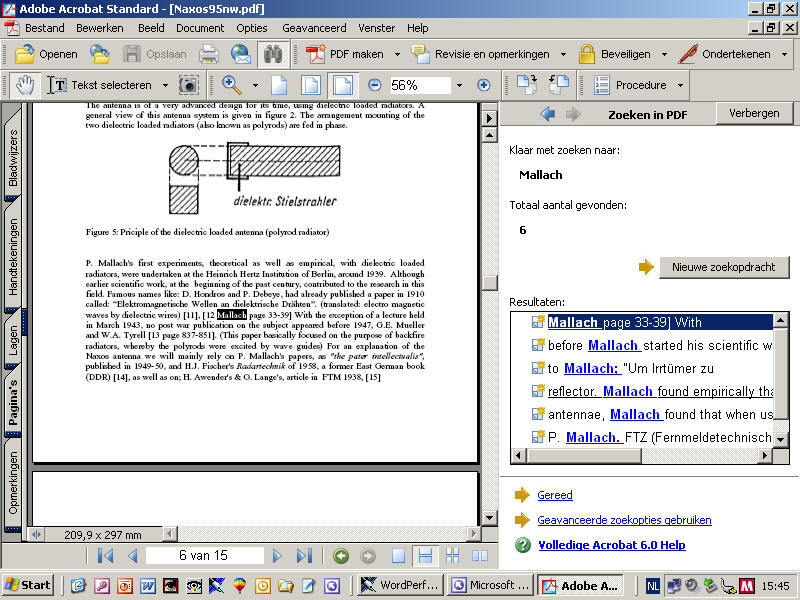 Select, as shown below, the binocular button (icon) for a search command (zoeken). We go now to the search field on the right-hand side (welk woord of woordgroep wilt u zoeken?) I have entered, for this occasion, the word "Mallach". Shown is, that "Mallach" has been traced six times. 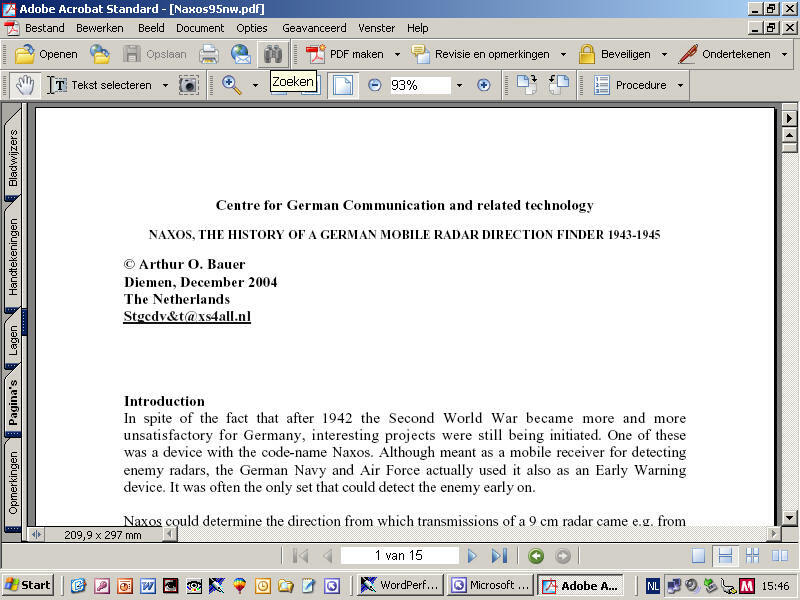 The cursor has jumped to the first reference found in the document. Searching, for instance, in the PDF patent dbase can be commenced in the same manner. One difficulty might be, that it has been created in three different languages (it never was supposed to appear on this website). One can enter terms such as: Marconi, Telefunken, S&H (=Siemens), (C.Lorenz=Standard Elektrik Lorenz=SEL), Radar, Benito, Coherer(=Fritter), Funkpeil(=DF), Navigation, Hülsmeyer or that like. Röhre is the German word for valve or tube.